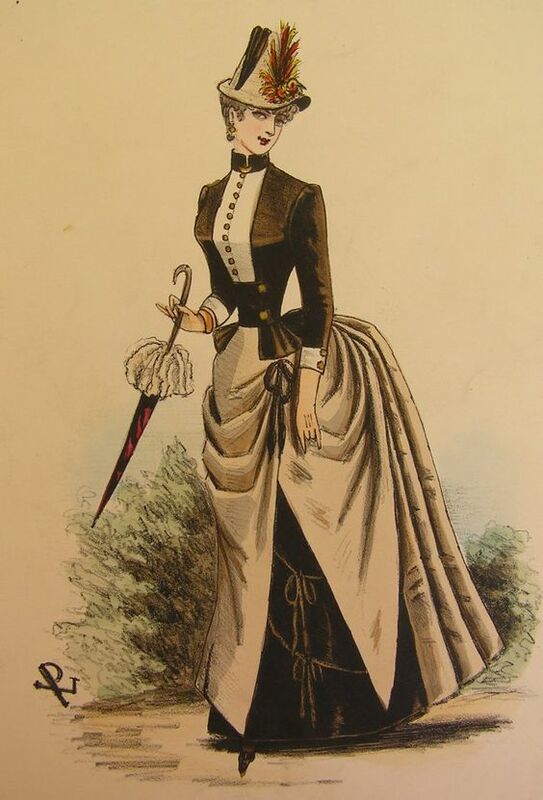 The mid-1880’s are all about the dramatic silhouette. The bustle is back in full force, and the fashion is for a small waist, full bust and relatively broad shoulders. In fashion plates you can clearly see this fashionable shape, which is of course exaggerated to near impossible proportions. 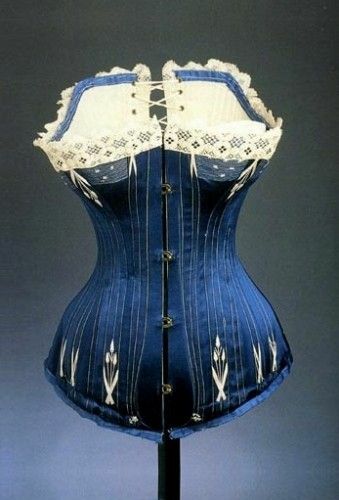 That’s when the idea for a new corset started, to be patterned on top of a padded bra. In my previous post I showed the process of patterning, and afterwards I could finally start making the corset! 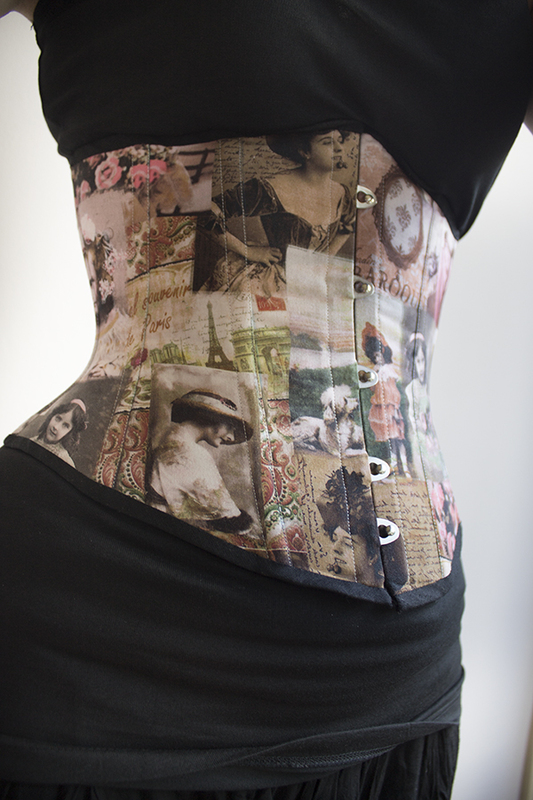 It’s a single layer coutil corset, so there’s no extra lining or fashion layer. First order of business was inserting the busk. Because there’s no extra lining, I cut a facing for the center front, and the bust is inserted between the facing and outer layer. 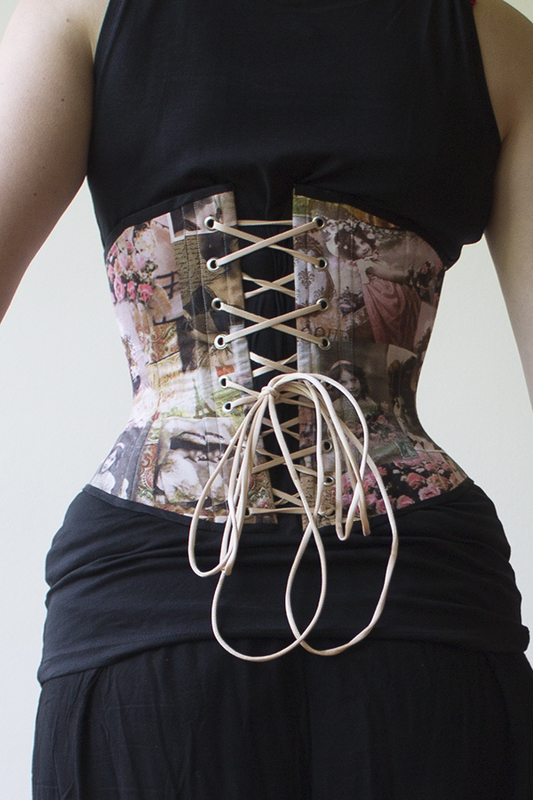 I really love cording on corsets, and wanted to incorporate it in this one as well. 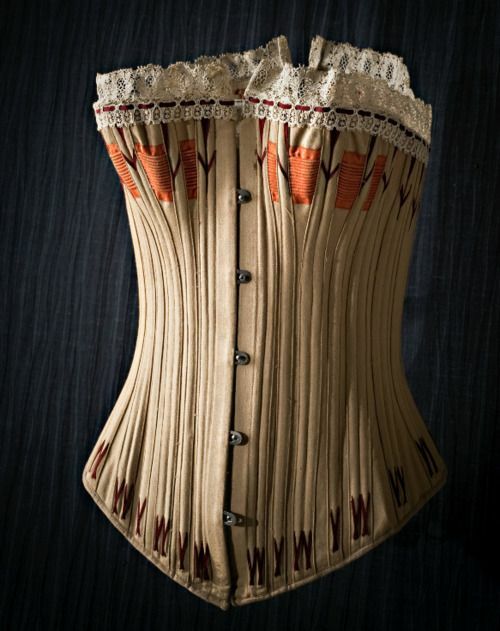 As first I was wondering if it’d be possible with a single layer, but then I saw this corset on a visit to Stockholm. As you can see, there’s an extra piece of fabric placed on top of the main fabric to serve as corded panel. I decided to copy this method. Using small pieces of black taffeta, I stitched 15 thin cords onto the two front panels (on each side). As in the example above, I left the bottom and top piece of the taffeta uncorded. I made a test piece first. cm next to it to see the tiny cords. 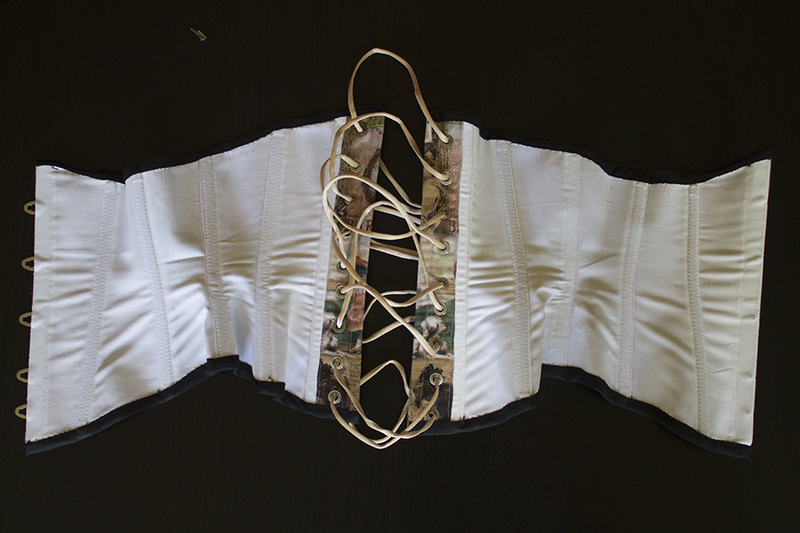 After that, I corded the actual corset panels. Construction was done after the cording, and was pretty straight-forward, I didn’t take a lot of pictures of these steps. All pieces were stitched with wrong sides together, leaving the seam allowances on the outside. The boning channels were made from a cotton polyester mix, leftover fabric from my red spencer. 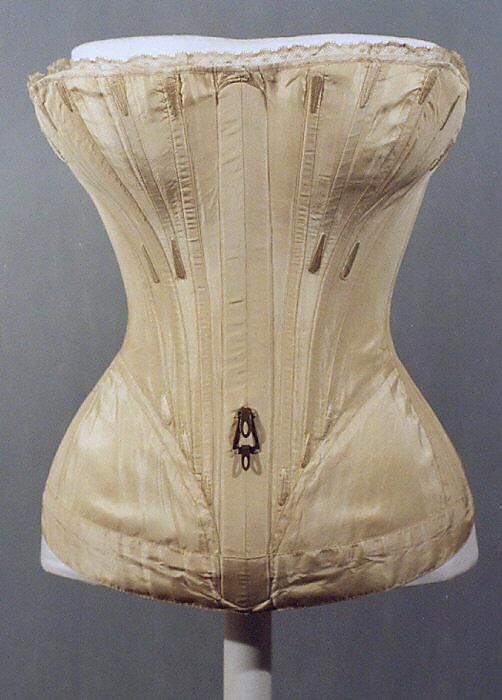 The red with the black gives a lot of extra drama, and you do see contrasting boning channels in the 1880’s quite a bit, such as this yellow-black combination. 5cm wide strips were cut and sewn into tunnels with a 5mm allowance, creating 2cm wide tunnels. Those were then stitched on top of the (trimmed) seam allowances and stitched on in the center and to the side. This created space for 2 5mm wide bones (synthethic whalebone) in each channel. The center back also has a facing, creating 2 layers for the eyelets and an extra channel next to the bones. I also added one more boning channel for 1 bone next to the eyelets. Both this one and the center back were flat steel bones for extra strength. After the boning channels the boning was cut, the edges molten (plastic is so much easier to finish than steel! 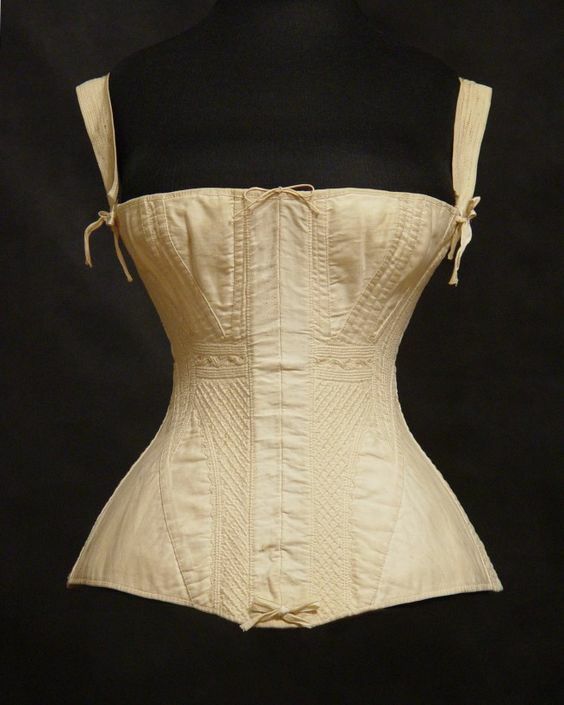 ), and inserted into the corset. The binding was machine stitched on, I used regular black cotton bias tape. The final big step was the flossing. I love the fancy decorative flossing you see so often in the 1880’s. 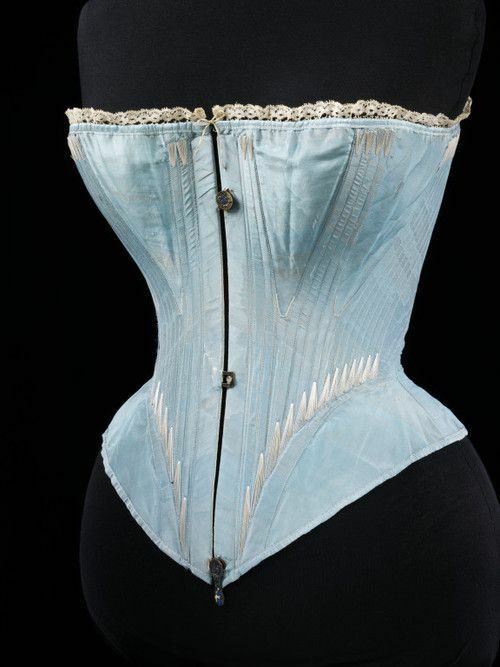 I looked around for inspiration, and eventually settled on the design of the corset below. I like the flowers, and how it covers 2 bones. I made a little prick-template so I could place dots on strategic places of the embroidery pattern. This way, all the bones will have the same size and proportion flossing. I adapted the pattern slightly to also floss the single bones in the center back. Before you begin flossing it feels like you’re almost done, but I think the embroidery might’ve taken as much time as all the rest of construction… I did 20 double bone motifs and 4 single bone, the double bone ones took about 25 minutes to complete each. And that’s without the test sample. But, it’s done! I’m really happy with how this came out and I really love the shape. If I ever find some narrow antique black lace I might decorate the top, but as I don’t have that in the stash for now I’m calling it done. 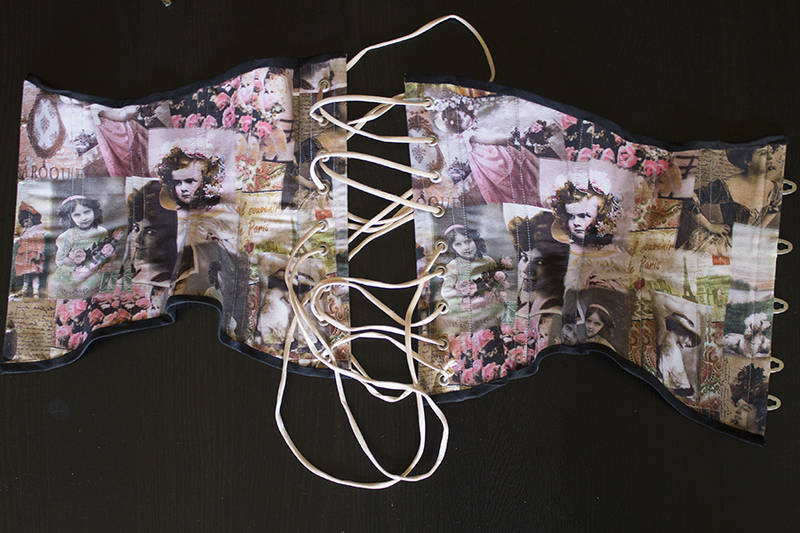 Remember how my last underbust corset started out as a mock-up? When I started the mock-up I already had the fabric I wanted to make the corset in. Those plans got delayed though, as I decided to just fully finish the mock-up. I’ve now finally finished the underbust it was supposed to be! As you can see in the image, both the left & right side are layed out here. I used the pattern pieces from the original underbust to fill the other side, the differences were quite small and this allowed me to see if I had enough fabric. Obviously, I used the correct ones for cutting out. I didn’t take any pictures during construction this time, but I did try something new! (aside from the pattern-matching, because doing that for the first time was a perfect moment to try a new technique…). Previously I’ve used the ‘stitch-in-the-ditch’ method, using very wide seam allowances and folding them back on both sides to create channels, using bone-casings on the inside not following the seams and using bone-casings on the outside following the seams. 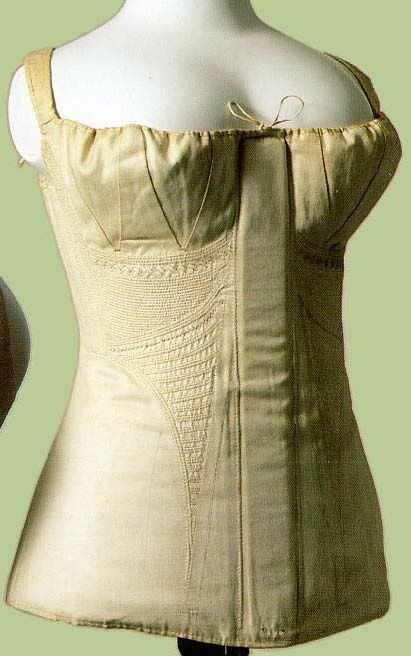 For this corset, I used the welt-seam method, constructing it both layers at the same time front to back while enclosing the seam allowances between them. I think it worked okay, and I quite like the technique, although I’m not sure it’s best for pattern matching. It requires you to pin both the strength layer and the fashion layer at separate sides to the previous panel, which makes it a bit fiddly. It gives a very nice finish though! I used coutil (also a first, it’s a lot sturdier than previous corsets now! ), and I didn’t line the corset as all the seams are nicely hidden. I’m not 100% happy with how the pattern-matching turned out, but for a first try I think it worked okay. I was also too lazy to un-pick anything, as it’s only noticeable from up close where the matching is not perfect, so it’s entirely my own fault. I do still really like the fabric for corsetry, and it was another good learning experience doing new things! 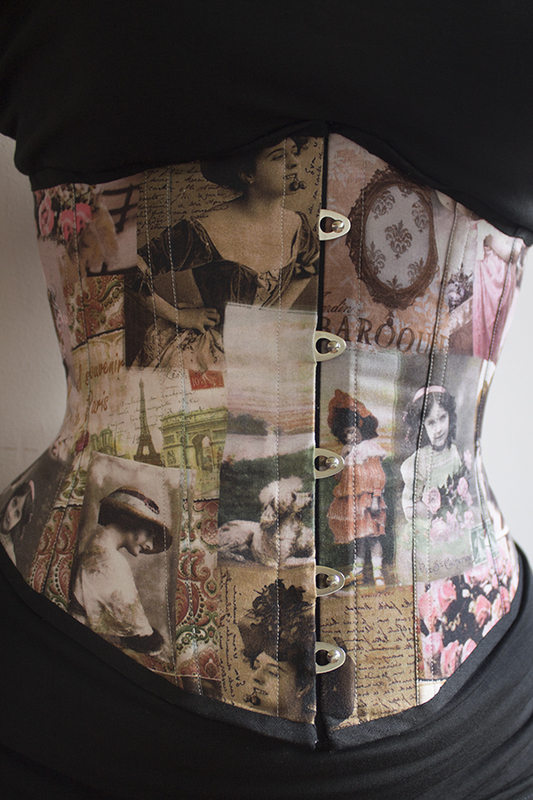 Some images of the finished corset. And laying flat (sort off). As you can see, it’s a lot smoother on me, but this shows off the pattern.